The new range is full of all the things people love about Helga’s, without the gluten! The expert bakers at Helga’s are excited to reignite the love of bread for gluten avoiders and people with coeliac disease, as they launch their latest gluten free bread range, including five loaves and two rolls. With 1 in 10 Aussies looking to avoid or reduce gluten1, Helga’s understands the increasing demand for the gluten free “real bread experience”, reformulating the recipe with big slices, a soft texture and packaging in regular twist bags. This means gluten avoiders and people living with coeliac disease can now enjoy a fresh, mouth- watering sandwich just like everyone else. The new range offers five delicious loaves including, Traditional White, 5 Seeds, Soy & Linseed, Traditional Wholemeal and Mixed Grain; and rolls in two flavours, Traditional White and 5 Seeds. The Helga’s gluten free bread range is available nationally at Coles, Woolworths and independent supermarkets for $6.99 RRP. Availability may vary. 1. Beat the eggs together with milk and 1 tablespoon of the honey. Gently dip 4 slices Helga’s Gluten Free 5 Seeds Bread into egg mix for 15 seconds. 2. Heat half the butter in a large non-stick frypan over medium heat until bubbling. Lower soaked bread slices into hot pan. Cook gently for 3-4 minutes, on each side, or until golden and crisp on each side. Repeat to make second batch and cover with foil to keep warm. 3. Spread half the French toast slices thinly with natural peanut butter and top with sliced banana. 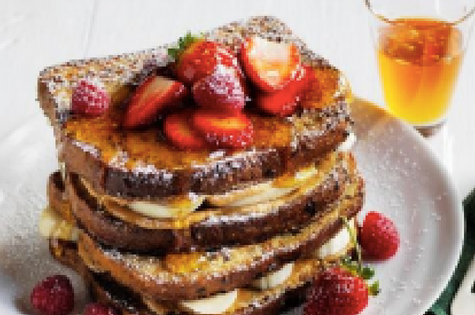 Stack together with remining slices of French toast. Scatter with berries, dust icing sugar over and drizzle with remaining honey. 1. Preheat oven to 200C (180C fan forced). Line an oven tray with baking paper. Process Helga’s Gluten Free Traditional Wholemeal Bread into rough crumbs. 2. Split chicken breasts in half to make 4 schnitzels. Dust in rice flour, dip in egg, then coat in breadcrumbs. Spray both sides with olive oil and arrange on tray. Bake for 8 minutes. 3. Meanwhile, cut haloumi into 4 thin slices and pat dry with paper towel. Place on tray with schnitzels and bake for a further 8 minutes, until schnitzels are crisp and haloumi is golden brown. 4. Spread base of each Helga’s Gluten Free Traditional White Roll generously with relish. Top with chicken, haloumi, capsicum, cucumber and rocket. Spoon tzatziki over the top. Serve with sweet potato chips (optional). Tip Cut 750g sweet potato into 1cm thick chips. Toss in 1 tablespoon olive oil, spread over a lined oven tray and sprinkle with 1 teaspoon sea salt flakes. Bake 15-20 minutes at 220C (fan forced 180C), until tender and golden brown. Continental foods always are testy and everybody like a lot of Continental foods. Here I see your amazing product and I am thinking I need it soon and also I want to eat it soon. Do My Essay for Cheap because students need it. Really Continental foods are always yummy.. !! !